Coffee Gift Baskets are a perfect gifting option, indeed. At Hale Kai Lana, you will find a huge selection of elite coffee gift baskets and gourmet coffee gifts for every taste preference and budget. Whether your dear ones love flavored coffee, specialty coffee blends or Macadamia Nuts, you can easily find perfect Coffee and Chocolate Gift Baskets for them. The "Big Island" Handled Gift Bag comes with 2 lbs of Kona coffee. Choose from Dark or Medium Roast or one of each and select either Whole Bean or Ground. 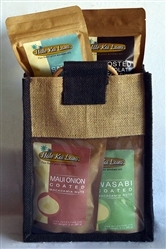 The "Maui" Handled bag includes one 1 lb. Kona coffee and one (8 oz.) bag of Macadamia Nuts of your choice. 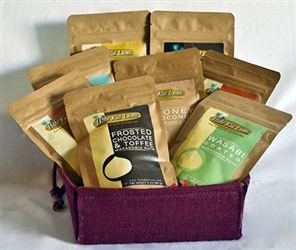 The "Oahu" Handled Bag with Mac Nut Sampler includes: eight (3 oz.) bags - One of each variety: Roasted and Salted, Honey Roasted, Honey Coconut, Wasabi, Hot & Spicy, Maui Onion, Frosted Chocolate-Toffee and Chocolate Covered Coffee Beans. Printed coffee bean drawstring bag includes one bag of Semi-Sweet Chocolate Covered Coffee Beans (3 oz.). Choose from Dark or Medium Roast and select either Whole Bean or Ground. Then select the Macadamia Nut flavor of your choice. 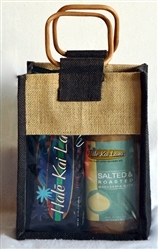 The Tall "Mauna Kea" Bag includes: one 1 lb. bag and one 1/2 lb. bag of Kona coffee. Choose from Dark or Medium Roast or one of each and select either Whole Bean or Ground. "Hang Loose" with the Ono taste of our "Shaka" Box and your gift will be a much welcomed surprise. This box is packed with two each 1/2 lb. bags of the finest Kona coffee, you choose the roast and grind - Medium or Dark, Whole Bean or Ground. 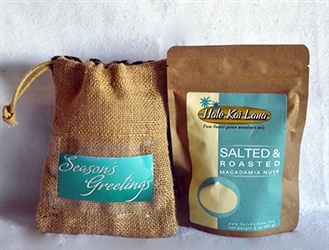 The box also contains one 8 ounce bag of our signature Roasted and Salted Macadamia Nuts and our exclusive Halē Kai Lana signature coffee mug.This gift set is offered in a beautiful high-gloss, colored gift box and is adorned with a large beautiful bow. Our "Da Kine" gift comes in a beautiful high-gloss, colored box and is adorned with a large colored bow. The contents include 1 each 1 lb. bag of HKL's 100% pure Kona coffee in your choice of Medium or Dark Roast, Whole Bean or Ground. In addition, you'll find two 8 ounce bags of our gourmet Macadamia Nuts in our two top- selling flavors, Roasted and Salted and Frosted Chocolate. Also included is our HKL logo'd coffee mug, perfect for savoring your Kona coffee. “Get swept away”with the gift that is fit for a King…or Queen! This gift set is offered in a beautiful high-gloss, colored gift box adorned with a colorful bow. The contents include 2 ea. 1 lb. bags of our 100% pure Kona coffee in your choice of Medium or Dark Roast (or one of each) in Whole Bean or Ground. And to further spoil the recipient or yourself, we have added two 8 ounce bags of our gourmet Macadamia Nuts and have selected our two top- selling flavors, Roasted and Salted and Frosted Chocolate. Also included is an HKL mug, all ready for that first decadent cup of Kona! Make a statement with this thoughtful and unique gift from the land of Aloha! There's nothing like a delicious pick-me-up in the afternoon, or anytime, and this gift is sure to put a little spring in anyone's step. Our signature Halē Kai Lana coffee mug is brimming with 8 ounces of chocolate covered Kona coffee beans. It arrives wrapped in a glossy, colored box and adorned with a beautiful colored ribbon. 11 oz. Signature White Ceramic Mug. What better way to enjoy a decadent cup of fresh, piping hot, Halē Kai Lana Kona coffee than in our bold and beautiful coffee mug! Dishwasher and Microwave safe. Coffee sold separately. 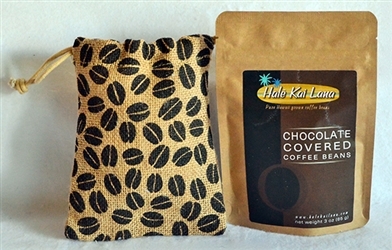 Hale Kai Lana’s Single Serve Coffee Cups is a “must-buy” to enjoy that authentic Hawaiian coffee taste to the fullest. Featuring our Company’s logo, this glazed ceramic mug is perfect for hot beverages. The best part is that Single Serve Coffee Cups are easy to handle. Get your buy now!